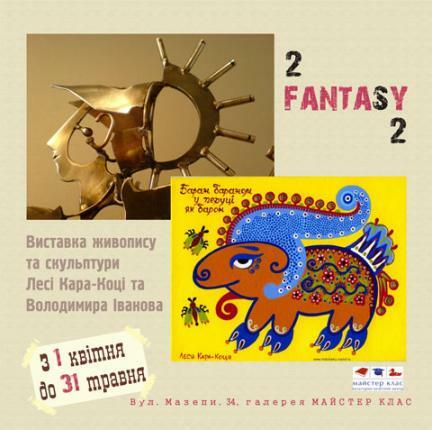 Joint exhibition of Lesia Kara-Kotsya and Vladimir Ivanov "Squared Fantasy" will be in "Master Class" gallery, Kyiv, Ivana Mazepy str., 34. The world of fantasies and games define a personality. It would seem - what is common between nice, domestic "ukrainian folk fantasy" of Lesia Kara-Kotsya and refined "techno-ellinism" of steel horses and warriors of Vladimir Ivanov? If Lesia Kara-Kotsya is playing dolls, Vladimir Ivanov is playing soldiers. The swift horse, legendary heroes, doom arrows. If Lesia's instrument is a Color, Vladimir's openwork metal calligraphy works with a Light. These two artists surprising shade each other. There is two worlds in front of you. Two fantasies. Squared Fantasy specifically.